Home › Latest News › Ladies-only Garage Party 2018! 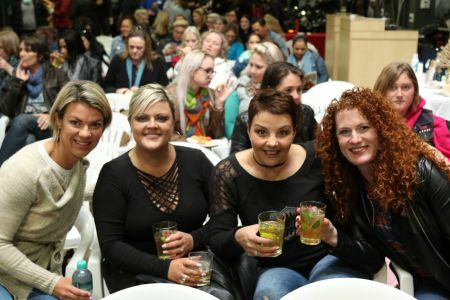 Every year, Harley-Davidson® Tyger Valley hosts a Garage Party for the ladies in our community and everyone is welcome to join in on the fun – whether they ride a bike or not! The point of the evening is to bring women together and inspire them while providing a platform for them to network, make new friends and feel equipped to move forward in their lives. This year was no different: the line-up included something for everybody! From comedy, to life advice and demonstrations, the evening was one to remember. The first 60 ladies to register qualified for epic goodie bags with items sponsored by Hammer Down Coffee Cartel, Pulp Kitchen Willowbridge, Hussar Grill Willowbridge, Schweppes, Havana Club Rum, Goji Spa, Liviya Lingerie, Lyon Promotions and Events and more! Though the event only started at 6pm, ladies began filling in from about 5pm, eager to get the party started! They were welcomed with complimentary snacks and welcome drinks from Havana Club Rum. While they waited for the festivities to begin, they were able to talk to our vendors and purchase items from Liviya Lingerie, get a quick makeover from Urban Decay cosmetics, enjoy a free shoulder/ hand massage from the ladies at Goji Spa or shoot the breeze with the team from BikiniBoots. We kicked off the evening with belly laughs from comedian Chantal Jax Venter, who had the crowd in stitches with her witty set! After that, we couldn’t resist jumping into prize giving with some spot prizes thanks to Hammer Down Coffee Cartel, Goji Spa, BikiniBoots and Lucozade. Next up, we had some truths about money come our way thanks to Money Awareness Facilitator, Lisa Rouhana! Lisa shared a bit of her own journey with money and also had some tips to help give us perspective on our relationship with money. The next spot prizes given away were from the Tyger Tavern, Liviya Lingerie, hampers from our Dealership and Urban Decay cosmetics. Next up, our final speaker from BikiniBoots, Lisa Viljoen, took to the floor. Lisa showed us some incredible transformations from the BikiniBoots Bootcamp team and presented a special 2 for 1 offer to all the ladies interested in attending a class with them! Our last spot prizes came from MFC – a division of NedBank (hampers) and genuine H-D® purses from our dealership. Last, but certainly not least, Patricia – our Chrome Consultant, demonstrated how to lift your bike if you drop it and there is no-one around to help. This information can prove to be invaluable! After that, we opened up the floor for ladies in the audience to give it a bash. Well done to those who gave it a try! Both before and after the event, Garage Party attendees also had the opportunity to try out our Jumpstart, which is a stationary machine that we mount a motorcycle to, allowing for attendees without licenses or riding experience to feel what riding a Harley® feels like! The team from Hirsch’s provided rich, creamy coffee for everyone too. To top it all off, the incredible team from One FM 94.0 broadcasted from the event and interviewed speakers and attendees afterward. Thank you to our front of house team who facilitated this event and made the behind-the-scenes rush run smoothly. Also, thank you very much to each person and sponsor that made this evening one to remember! We look forward to next year’s event and hope to see YOU there.